What you couldn't kill a cow? Good luck with not eating beef this week. You realize that's how I became a non-meat eater, I cut out beef and pork first. Then I got really sick of chicken and had to stop eating it. Thankfully I still eat fish. Even though cows are very dumb and messy I have to admit I do like them and would love just to have one. Yes, I'm a bit odd. No, I think lots of people would like to have a cow. I was doing some work at a site that had a resident herd of cows and we adopted one for the week. "Daisy" greeted us every morning when we pulled up to the site. I would love to have goats. My parents have a sod roof on their garage and for a while we contemplated the idea of having a pygmy goat up there to keep the grass clipped. It's been an interesting week in terms of eating. I broke my vow almost immediately because I'd just bought several packages of humbow (I don't know how you spell it) that were filled with BBQ pork-my favorite! I decided that since I'd bought them pre-movie experience, I wasn't going to waste them. Same thing with the hamburgers we had last night. I didn't eat beef or pork for about two years in college but I couldn't give up poultry or seafood. Eventually I went back to eating red meat but we've been trying to limit our intake. I think Chris was most disgusted by the stats on beef: something like 11 pounds of grain is required just to produce one pound of beef. 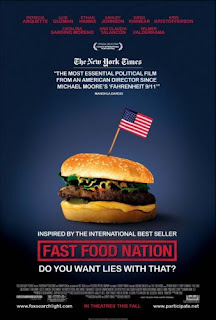 just watched Fast Food Nation, it's an impactful flick to say the least... earlier today i passed up a sausage mcmuffin because of it. Evidently it is worth passing up fast food for more than health reasons.